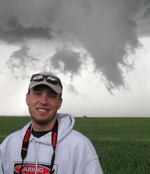 Our team is comprised of some of the most experienced storm chasers from around the world. We understand meteorology and concentrate on good forecasting techniques to intercept severe weather and ensure a successful storm chase on every tour. 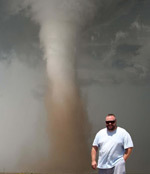 Todd Thorn - Tour Leader/Severe Storm Expert - Bozeman, Montana - I will be on all tours. 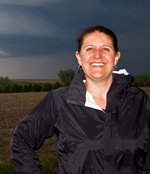 I have been fascinated by severe storms and tornadoes since I was just six years old, and as a result, I began studying severe weather at a very early age. Over the years, I read every textbook on the subject and spent many days watching severe storms form over my hometown. My nights were spent watching vivid lightning from my bedroom window as the sound of thunder shook the house. To be a storm chaser, you must be able to read the sky and see visual clues for severe weather, such as the meaning of distant towering cumulus clouds. All the schooling and onboard information is good, but it takes years to learn how to read the sky and tell where the next storm will form. 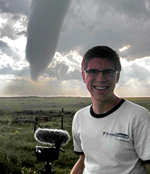 I have been chasing severe weather since 1991 and have a background in meteorology. In 2019 we will be operating our 22nd year of Storm Chasing Adventure Tours. We have been featured in numerous television documentaries, news programs, and in more than 200 newspaper and magazine articles published around the world. Since I founded Storm Chasing Adventure Tours in 1997, our emphasis has been on good forecasting techniques to intercept severe weather for a successful storm chase on every tour. I look forward to seeing you in Tornado Alley during 2019. 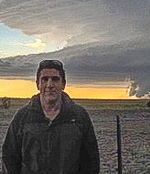 Hi, I am from Perth Western Australia and 2019 will be my 13th year chasing storms with Storm Chasing Adventure Tours. I have had a keen interest in severe weather from a young age and I have been fortunate to see many amazing tornadoes and intense lightning displays . Seeing a tornado for the first time was truly an amazing experience, it certainly got the heart pumping. Every day is like an adventure, who knows where you will end up and what you might see! Regardless of if you see a tornado or not, it's an experience of a lifetime and one not to be missed. I look forward to traveling with you all in 2019. The 2019 chase will be my tenth season storm chasing with Todd. Despite living in England, my long annual trip over to meet up with Storm Chasing Adventure Tours is my most anticipated of the year. Storm chasing is a hobby rather than a career for me as I am the MD of a travel company where we try and send people where the good weather is! I have always had a fascination with severe weather and as a youngster I dreamed of seeing a tornado. Sadly in the UK, it only gets as bad as severe thunder and lightning, and when this happens I can normally be found outside (My family thinks I am mad). I am also a keen photographer and enjoy the photo opportunities that arise whilst chasing storms. I look forward to seeing you out on the Plains in 2019. Hi, I'm Phil from England. 2019 will be my fifth year out chasing with Todd and the team. I can honestly say that had you said to me, before I starting chasing with Todd, that every year I would count down the days until my next storm chasing trip, I would have probably chuckled. But four years on and that is exactly what happens! Since being persuaded by Chris (my brother and another Storm Chasing Adventure Tours Guide) to come storm chasing with him back in 2013 I haven't looked back. 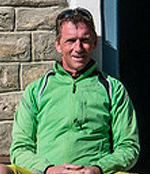 You will meet loads of really nice people and experience some extreme weather in the process. 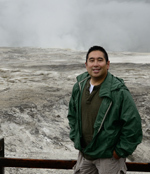 Hi, I'm Alan from Orange County, California, and I'm excited to be chasing again this year with Todd as I have nearly every year since 2002. I've been a weather junkie all my life, but being a native Californian I've always lived in the absolute worst place for it. I can remember as a child staying up all night in hopes of just catching a flash of lightning or a rumble of thunder from our infrequent thunderstorms. That's why I look forward year-round to when spring rolls around so I can once again witness the awesome spectacle of some of the world's most severe weather in the Great Plains. I'm currently taking a long break from work life and doing a lot of international travel while concentrating on two of my favorite hobbies: scuba diving and underwater photography. 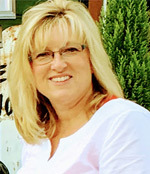 Hello, I’m Cindy, and 2019 will be my 8th year chasing with Todd. I have always lived in Southern California where we don’t get any exciting weather, at least nothing compared to Tornado Alley. I work as a human resources manager for a large international retailer, so this annual trip is quite a departure from my everyday. While chasing I have seen numerous supercells, amazing lightning shows and met many great friends from all over the world along the way. I look forward to another exciting week full of adventure and great memories chasing in the Plains… keep your eyes to the skies! Hi, I’m Ade from the UK. A retired detective of 30 years, I was asked last year if I would like to drive clients on a storm chasing tour across America. I jumped at the chance. 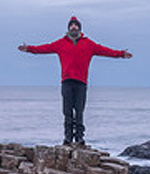 I am into all things outdoor, mountain biking, surfing, paddle boarding, mountaineering, and photography. This will be my fourth trip to the states. Previous trips to the US have included mountain biking and snowboarding. The most extreme weather we get in the UK can be described as wet and windy with a bit of snow and ice, so I’m looking forward to meeting a variety of interesting people and experiencing some great weather and adventures with you. See you on the plains. As a young boy, Anthony would huddle under the bed covers at night, watching the lightning flashes through the edges of the shade and listening to the rumble of thunder as it shook his house. 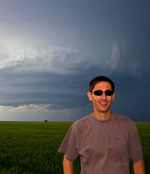 Today, after a 25+ year career with the U.S. Department of Justice and the Department of Homeland Security as a special agent, Anthony has traded in his handcuffs to pursue his dream of chasing thunderstorms across America and seeing a tornado drop from the sky. 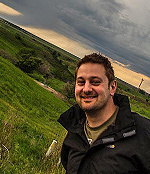 This will be his fourth year of storm chasing with Todd; his first year was filled with beautiful lightning bolts, manure-filled windstorms, bruising hail, and days filled with adventure. His hobbies include photography, learning to play the piano, and scanning the sky for storm clouds. He looks forward to sharing adventures and stories with you as we go storm chasing. This is my 12th year with Todd. When I was a small child growing up in Louisville, Kentucky I was fearful of thunderstorms. This fear turned into an intense fascination with weather during my elementary school years and signaled an exciting career ahead in broadcast meteorology. I started my own weather forecast website for the Louisville area when I was in high school and that's when Storm Chasing Adventure Tours owner Todd Thorn found me. Since then I've been chasing with Todd and have seen more than a dozen tornadoes. Thanks to Todd I also got a head start in my severe weather education and went on to earn my meteorology degree from Mississippi State University. During my college years I was a weather forecaster at a TV station in Tennessee and now I'm living my dream as a meteorologist at WAVE 3 News in Louisville, Kentucky. I put my skills to work for you through my daily weather briefings and by helping you understand the weather that's happening as we chase. We're going to have a blast this 2019 season! I’m Jason and like my friend Ade (Adrian, above) I was a detective in the UK and retired last year after 30 years service. I am a passionate landscape photographer and have travelled a lot since retiring, photographing many great locations. I had always seen storm chasing videos on the TV and YouTube and it was a real ‘Bucket List’ adventure for me when I came on Tour 5 last year as a guest. I had an amazing time and captured some spectacular weather during our chase, which I created into a small video that can be seen here: https://youtu.be/Biy8XdMPVAY. I’m delighted to say the lightning shot I took near the end was shortlisted this year for the Weather Photographer of the Year. I’m hoping for similar adventures this year. Hello, my name is Robert Koch and I make my living selling merchandise on the auction website eBay. This will be my 13th year chasing with Todd and I look forward to another exhilarating chase season. I have always been intrigued with severe weather since I was a wee lad and the last 12 seasons have been most stimulating as I met many great storm chasing enthusiasts and weather professionals. Chasing with Todd across the great American Plains is always rewarding whether we see tornadoes, severe storms, or spectacular lightning displays. Best Regards, Robert. When the weather turns nasty and everybody is heading for cover, I'm headed outside to watch the clouds roll in. Chasing tornadoes is the next logical step. I'm Nancy Young and I make my home in the St. Louis, Missouri area. I am a wife and mother to three grown sons. Severe weather has fascinated me all my life, from blizzards, to hurricanes, to earthquakes to tornadoes. 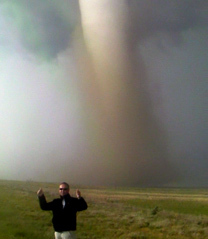 Chasing with an experienced guide like Todd Thorn allows me view a tornado in the safest way possible.